Photo courtesy of Parks & Rec. A photo of last year’s build a snowman winner. 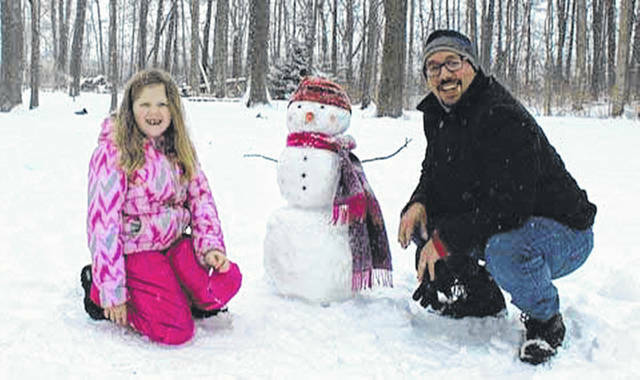 BEAVERCREEK — Winter weather bringe snowflakes to build a snowman. Grab your camera and get ready for Beavercreek Parks & Recreation’s Do You Want to Build a Snowman Contest. Take a photo of your snowman and email it to parks@beavercreekohio.gov between Dec. 3 and Feb. 11, 2019. Photos will be posted on the Beavercreek City Facebook page Feb. 15-22 for voting. The family with the most “likes” will win a Family Fun Prize Pack. Contact the Beavercreek Parks, Recreation, and Culture Department at 937-427-5514 or email parks@beavercreekohio.gov with any questions. View all activities at city website www.beavercreekohio.gov. https://www.beavercreeknewscurrent.com/wp-content/uploads/sites/49/2018/11/web1_lastwinner.jpgPhoto courtesy of Parks & Rec. A photo of last year’s build a snowman winner.